Paul Pires, a 2014 BSc Computer Science graduate, was awarded the Best Undergraduate Computing Student prize at City by the Central London chapter of the British Computer Society. 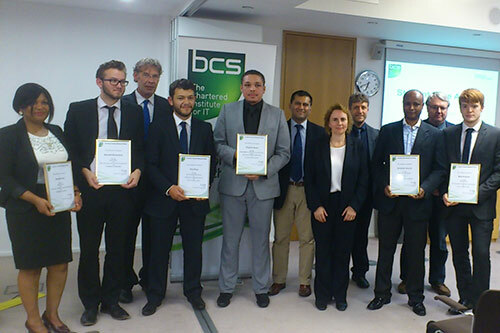 Paul Pires, (4th from left in the photo above) was awarded a student prize for 'Best Undergraduate Computing Student at City University London', by the Central London chapter of the British Computing Society, at the BCS's awards ceremony on 21st September. Paul graduated this year with a BSc in Computer Science. Alongside his award certificate, Paul was granted membership of the British Computer Society and a cheque. He was accompanied by Chris Smart (third from left in the photo), Undergraduate Programme Director for Computer Science, in the School of Mathematics, Computer Science and Engineering. Visit this link for more information on City's BSc Computer Science programme.